My name is Jack Deeney and, after serving some time as part of an U.S. Infantry Squad during the fighting in Korea, I was moved up to Battalion and eventually assumed the position of Battalion Intelligence (S-2) Sergeant of the 3rd Battalion, 17th Regiment, 7th Infantry Division. 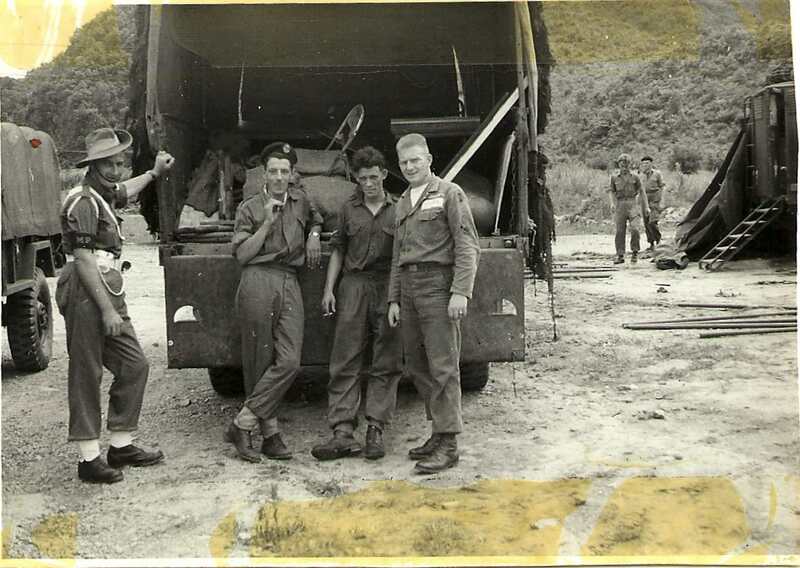 In this capacity, I was placed on a one-week assignment, starting July 25, 1954, with the 28th Brigade of the 1st Commonwealth Division, assisting them in war games. If I recall correctly, the units involved were the 1st and 3rd Australian Rifles, the Essex Rifles and the Northamptons. Why a failed college student and draftee like myself was selected to assist professional soldiers in 'war games' is something I still puzzle over to this day. At any rate, it was an eye-opening experience for me and I thoroughly enjoyed it. I have a photo that I treasure (attached) and would like to share it with you. I cannot remember much of what transpired that week, except that I was awoken each morning with a mug of tea, got my first taste of Foster's and marveled at the idea of fist-fighting just for the hell of it. While I have forgotten the names of the men in the picture with me, I recently came across some old letters I'd sent home from Korea. One referred to my brief involvement with the 28th Brigade and a friendship with "..one old Irishman, Paddy Gallagher, who has been in the Army for 34 years and has been though 4 or 5 wars." Whether or not he was in the photo I sent you, I do not remember, but I do still have the black beret and insignia worn by the 'bloke' in the middle. He gave it to me right after the photo was taken. I have many memories of Korea, good and bad (have even written about some of them) but this is one of the better ones.